What a remarkable period of weather we have been getting here in N. Ireland, at the time of writing it has been four weeks of strong high pressure with warm temperatures, calm winds, dry and blazing sunshine every day. A week of proper high pressure that's not a cloud fest is difficult enough to get in this country in recent years but to get four weeks of relentless sun has simply been unbelievable, perhaps even record breaking. I never took it all for granted but it was getting to the stage that when I woke up I knew it was going to be yet another sunny warm day, it felt like this was the norm despite being abnormal, I think everyone had been ready for it, I heard no complaints and everyone seemed in good form and energized by the well deserved heat wave. It was perfect for me, I will take blue skies and sunshine anytime over grey windy weather and this event spoilt me, however I was saying to the guys that if we got a few storms out of it then we can definitely call this heat wave a perfect event. Photography wise there was little to do, however I flew my drone a lot and spent time researching storms and improving my forecasting while sitting under blazing sunshine and spent several evenings 'chasing' hot air balloons passing over the local area which was great fun, all I needed was a storm and I would feel 100% content. Then it happened, the heat and humidity set off high instability and we ended up getting thunderstorm set-ups on back to back days. There where actually storms every day in the west of the country for almost 10 days straight, however the best risk days were the ones on which I made my plans, between June 1st and 8th I chased on six separate days and experienced 12 thunderstorms, 9 of which were at close range and 3 at a distance which I seen and heard rumbling, combine this with two funnel clouds and this really was a period of highly successful storm chasing for me combined with great memories. 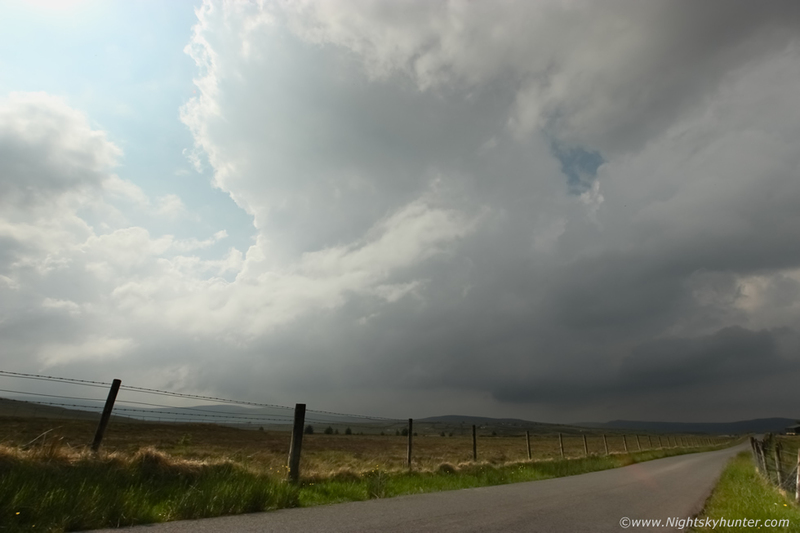 The highlight event was the June 1st storm near Benbradagh which had structure and boasted over one hour of constant thunder which was an absolute thrill to experience, you can check out that chase report here. If nothing else happened after that day I would still have felt happy and content however nature was not done yet by a long shot and was throwing up unstable set-ups almost on a daily basis. Getting storms from high pressure weather can be tough, new chasers who are wet behind the ears can get over excited by the CAPE values and anticipate wide spread severe thunderstorms and although this can indeed happen the reality is that you might not even get a storm at all. The CAPE is there, the moisture is there, however you also need lift, these are the three basic ingredients for thunderstorm formation, if you don't have a lifting mechanism to force air parcels aloft so they keep rising and form into clouds then you will more than likely end up with a blue sky bust which is every chasers worst nightmare, I actually feel it's an honorable let down for at least in a blue sky bust you get sunshine and a tan compared to a grey cloud bust. 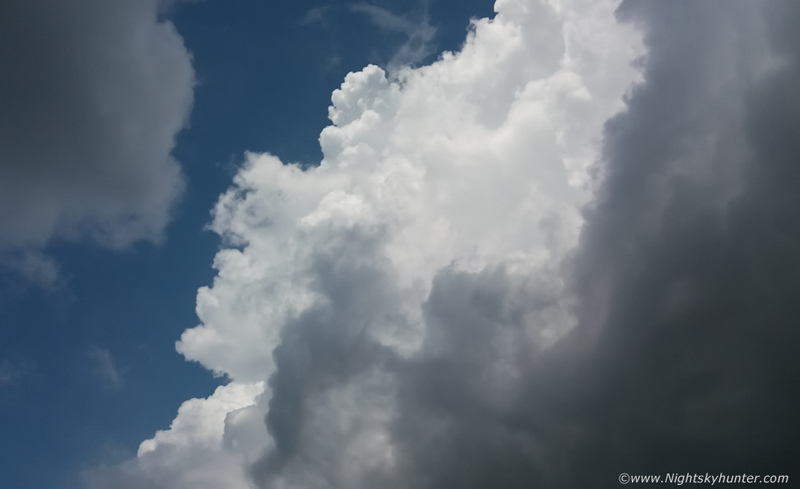 With low pressure it doesn't take much lift to force air parcels aloft, however because of high geopotential heights the air really needs to be encouraged in a big way, this process is usually gradual however when it happens storms can explode and change a sunny day into one filled with flash flooding, dangerous lightning, and even rivers of hail stones. Our daily set-ups for this entire period were similar, CAPE values ranged from 1000 to 1300jkg with a lifted index between -3 and -4. There was high humidity every day so there was plenty of moisture (juice) for storms to feed on so all these basic ingredients looked encouraging. However what about our lift?, well there are various forms of lift, orographic lift, solar heating, a front or trough, convergence or even local factors such as outflow boundaries from neighborhood showers. It so happened that we had many of these factors, by great fortune every day was clear and sunny, in fact, the sun was relentless providing intense solar heating, air parcels can also get help when they rise over hills and mountains, in fact, much of the storms which did form originally fired as cumulus clouds which condensed on upsloap countryside. However my favourite source of lift is the classic sea breeze convergence zone, convergence is when two more wind fields meet or 'converge', when this happens air is forced upward and becomes the focus point for updraught development and hence thunderstorm formation. Sea breeze convergence is a beautiful form of convergence which many people are unaware even happens, you don't need to be on the coast to experience it, actually if you are a storm chaser you want to be getting it well inland. You may have a slack SWly flow moving NE, however a NEly sea breeze would move onshore and after hours would travel into the midlands tens of miles from the ocean, then when the two flows meet you have convergence, this set-up is responsible for over 95% of funnel cloud and tornado observations in this country. As luck would have it we had most or all of these factors every day, the only thing which changed was the direction of the wind, however on all these days the flow was slack which also lent itself well to vortex phenomena. Due to having no jet stream nearby all storm days would be devoid of strong shear, this meant that our storm mode would be of the pulse type or 'pop corn' storms, they would not be organized and would not be classified as severe however this would not affect their impact, slow surface winds and outflow interactions would cause cell training and as a result a storm with new updraughts sprouting up could produce significant flash flooding problems and prolific lightning so these storms could make an impression. Aside from the lack of shear my only concern as a storm photographer would be structure issues, I love mean storms with dramatic clouds, I got structure on June 1st at Benbradagh however those storms used up a lot of juice and cleared out the air a little for the days ahead. Even though we could technically be getting surface based storms they were not likely to be very photogenic, due to a large spread in temperature and dew points storm bases would be high which more often than not results in not so great images (at close range, they look awesome from a distance). This didn't put me off at all, I've never been a storm snob and I have seen many surprises from such set-ups and after a long storm starved Spring I was delighted to get into this week long outbreak, the heat, humidity and high CAPE had me on the chase, the following is from three of these recent chase days. My plan was to get into Co. Tyrone, sit out and wait for visual developments then shoot SW into the Fermanagh area with the option of going NW into Donegal. I left Maghera at 11.00 and made my way into Co. Tyrone, it must have already been 22C at this time and would later peak at 24C, the air was calm, humid and very close, it felt hundred percent thundery. 1000 CAPE, LIs-3 and intense heating, after a lot of chat with the guys the previous night we expressed some concern over capping issues, the cold air aloft wasn't as cold as earlier in the week at -20C however I was certain it would break somewhere and we could get a storm. I pulled into a lay by on the Cookstown to Omagh road, this was outside Omagh looking W, my base target area had been a good decision, I was under blue skies for the entire time then when I reached here it was clear this was an area of convergence. 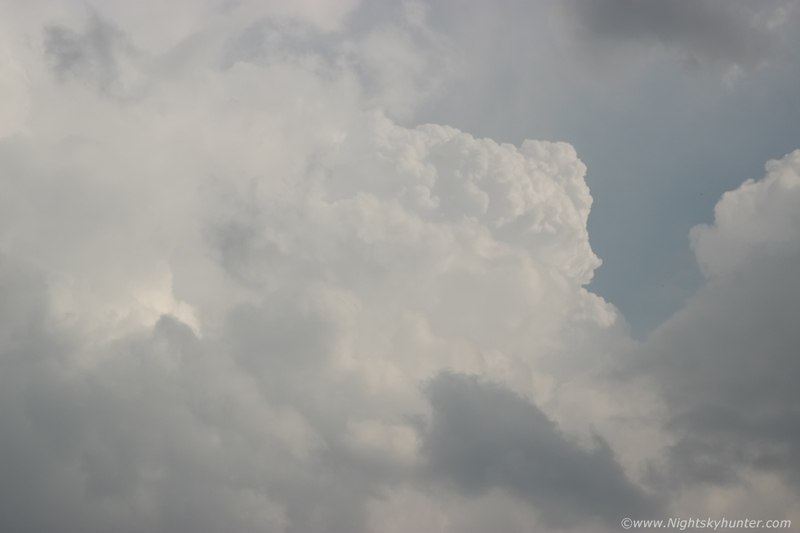 Convective clouds were stirring and merging in this one area and before long this cell was growing before my eyes. It was a slow process, building cloud by cloud and consolidating however its tower tops looked rather warm so capping was still being dealt with, I liked the look of the dark base and decided it was worth watching. Half an hour later precip curtains began to appear and a moderate shower was falling, this was a good sign, if this cell wanted to produce precip then things were very encouraging, I drove into the outer part of Omagh and stopped at a filling station as the rain pounded the area, I had time to kill, it was just after midday. I was getting hungry and luckily there was a fast food van near the station so I ordered a cheese burger and coke (it's difficult to eat healthy while chasing), I ran back to the van in a heavy downpour, but it actually felt nice, the rain was warm and refreshing so I enjoyed the soaking. 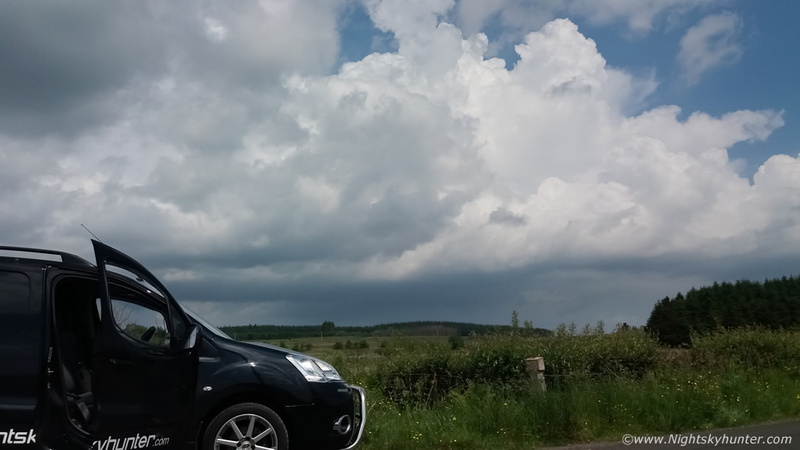 I was filming a vlog to document this chase too which helped pass the waiting time, it rained for an hour here and I decided I needed to get outside the core as I could be missing something so I went into town and parked in the Omagh park n ride car park. 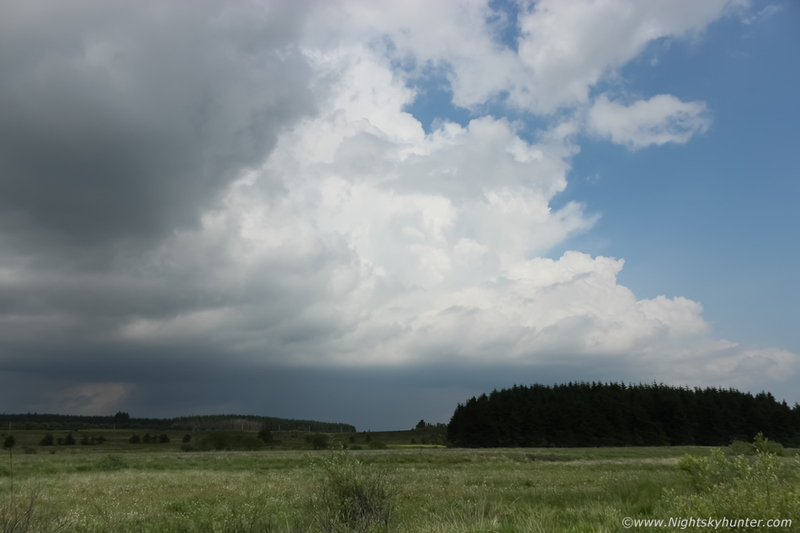 I was outside the precip core and back into warm humid air, the place was bone dry yet a few hundred meters up the road it was getting drenched. I could see the base of the cell moving into view at the other side of town, slowly creeping R to L, the same base I had captured before the rain broke out, I decided it was worth watching once more, although I wasn't expecting much, previous experience had taught me that slack winds and convergence can be a big funnel producing set-up, as long as there's heat and an updraught there's always a chance. 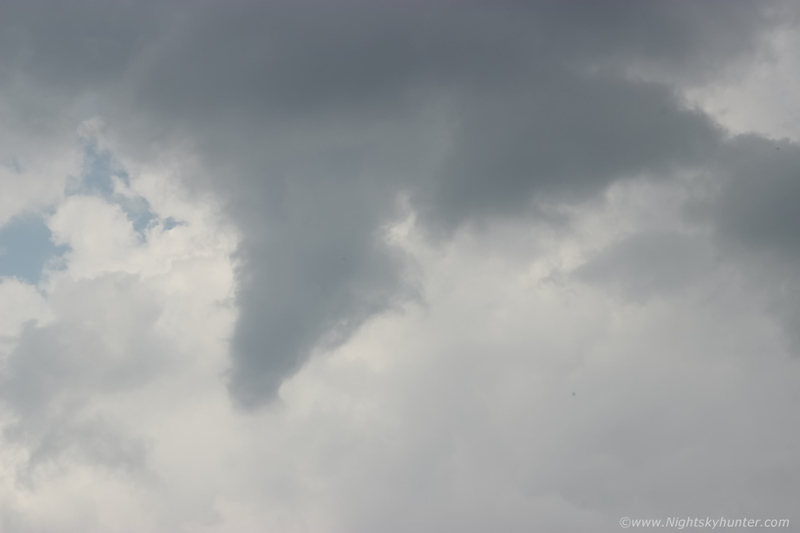 I opened my flask, poured in hot water, stirred the tea bag, took a sip and sat on a warm kerb to relax, I looked back at the base and there was a funnel cloud forming rite before my eyes. 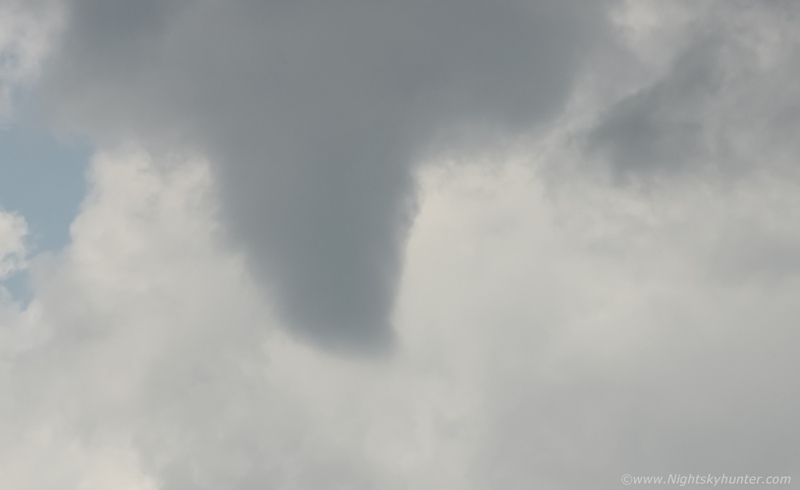 I ran back to the van, grabbed the gear and attached the 100-400mm lens and took a few stills, the funnel was changing shape in real time and through the lens I could see it rotating. My lens was really struggling to focus, thanks to the heat haze and a translucent curtain of precip between me and the funnel, the focus kept popping in and out and I had no time to manually focus with live view. There would be no time for that and besides I couldn't see a darn thing on my LCD screen due to the bright sun so auto was the only option. 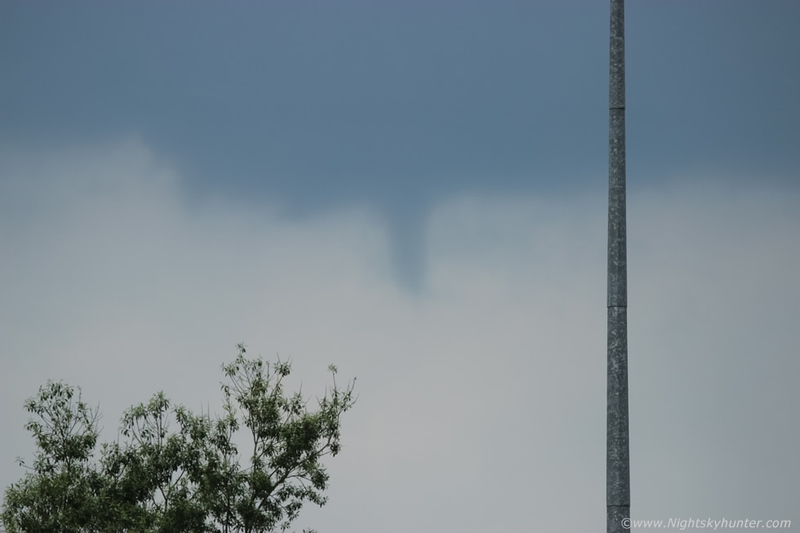 This funnel was located very close by to the N of Omagh, the time was 14.00 UT, I had to walk back and fourth among cars trying to shoot it between urban obstacles such as buildings, poles and trees, it was visible for a good five minutes then became slender and turned into a rope then vanished. My first funnel sighting of 2018, this had validated the trip already and there was still a good four hours of CAPE left yet. I went back to get my mug and the tea was still warm, that shows how quick funnels can appear then vanish, you really have to react fast to get them on camera. There still was a base on that cell so I decided to get away from the built up area so I drove into the countryside then onto the hills outside Omagh, however slow moving precip cores stayed there and for an hour I was under frustrating rain, so I went back into the countryside, got caught behind a slow moving tractor for miles, got annoyed and took the first turn off to the left I could find and ventured onto quiet country roads. By mid afternoon I had escaped from the precip and back into clear hot skies and by pure random chance my tractor evasive action had brought into view a cluster of solid towers to my NW so I gave chase, I was going entirely visual and just drove straight for them. I was driving through country roads I had never been before, somewhere on the high ground outside Drumquin, the roads twisted and turned, I would drop into valleys and the clouds would vanish from view below hills and hedges, then when I rose to the peak of a hill I would get yet another tantalizing view of the convection, it was like a roller coaster up and down, however this is what I love about storm chasing, you don't decided on where you are going and what you will see, it's nature which makes these decisions, as a result you often end up on roads you have never been and seeing beautiful countryside which adds to the experience. While en route the towers had formed a new cell and it looked great as I was driving with very low base and good inflow feeding into the surface based updraught, I couldn't get an image of it at that stage because of the hills so I kept driving towards it, eventually I pulled over onto a grass verge, close enough to watch the base but not too close to get stuck under the precip. Image doesn't do the scene justice, I was surrounded by lush fields, birds chirping, bees buzzing and sheep grazing, at random were small cottages and a few old derelict houses, the scenery was beautiful, it actually reminded me of 'The Quiet Man' with John Wayne, then having this cell perched over the fields was the icing on the cake. Correction, this 'cell' was now a thunderstorm, it began producing regular rumbles, in this image the storm was moving R to L, precip core to the L and rain free base to the R, plenty of fresh towers where lining up forming that base and the main updraught extended high above the frame, the lightning was all in-cloud, I could tell by the thunder, even though the storm was fairly close the thunder sounded like it came from a great height which indicated bolts hidden inside the tall updraught. 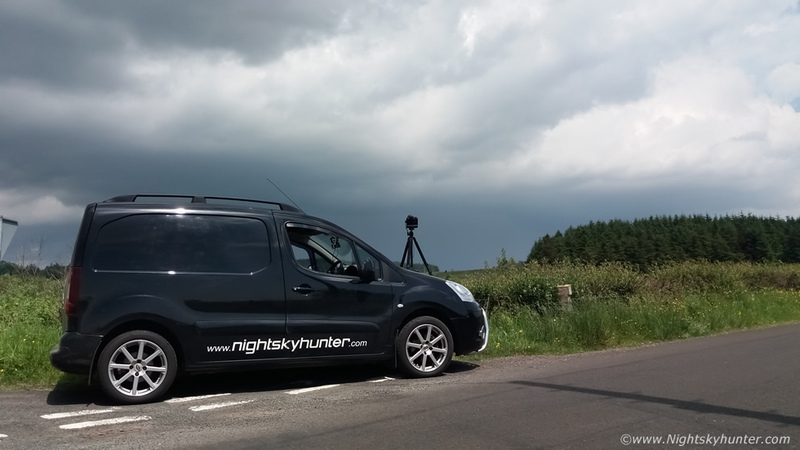 The slow movement allowed me to watch at my leisure, I opened the van doors and had another brew and snacks while I listened to the thunder and scanned for funnels. I watched this storm for 45 minutes then decided to drive closer past the distant turbines and into new territory, 20 min's later a new line of towers had formed across the skyline over the fields, the black bases hanging in the air, I was in perfect position yet again, I was parked beside a derelict building on a country road eating pop corn and watching the clouds. 20 minutes later that base turned into a new thunderstorm rite in front of me, big precip curtains broke out with small hail embedded within the downpours with loud angry thunder, jack pot yet again, that's two thunderstorms and a funnel this day, anything else would be icing on the cake. I then punched the core and drove NW into territory I had never been before in my life, somewhere between Drumquin and Casltederg, I pulled over to watch new towers bubble up. I was looking across acres of flat fields with the storm clouds aloft, this is what the great plains of N. Ireland looks like, sheep filled the fields and all was good. I was taking images then I noticed that a farmer and son had spotted me and began to walk in my direction, I was thinking oh no not some heat from a pisst off land owner, I wasn't in the mood for a confrontation as I was in good form, yet I stayed my ground and let him come closer. Turned out I had nothing to worry about, the farmer thought I was to do with the hedges or something, when I explained what I was doing regarding storms he was fascinated and so nice and easy going, in fact, I asked him if he would mind if I went into his field and shot time lapse of the storm clouds for 15 minutes and he told me to jump over and stay as long as I liked, he was such a nice friendly guy, people like him are such a pleasure to meet when out doing this kind of photography. So here's the base of a new cell moving to the L with nice base with the 24-70mm. Drove 20 miles back to Omagh then back on to the Cookstown to Omagh road, spotted a new cell then diverted back out onto the country roads once more, I parked on another gras verge (shocked I never got a puncture this day) and began shooting a new time lapse of this cell, I was just 1km away from Beaghmore Stone Circles. 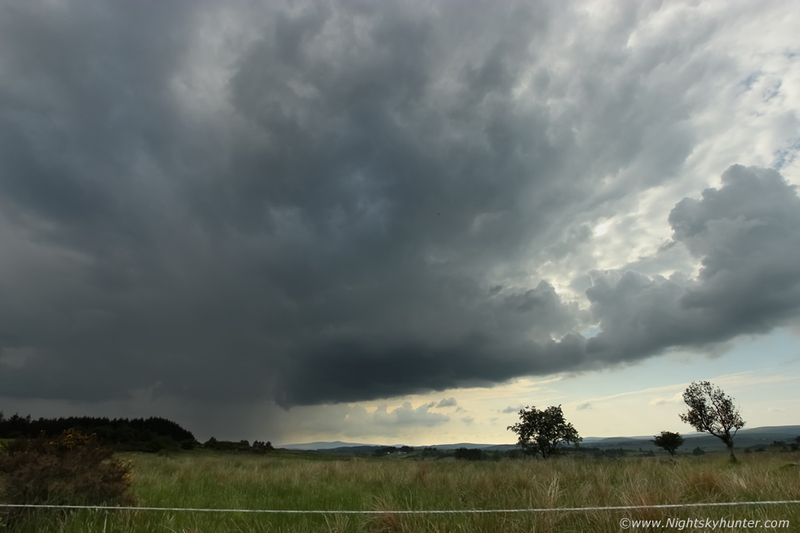 It was 18.00, the CAPE was moving SW and solar heating past it's strongest time so I watched the cell drift off and called it a day, the air was warm, humid, calm and sunny, dragon flies danced and birds sang, there's nothing that makes me more happy than storms over the countryside like this. I headed back home to recharge the batteries and check the charts for yet another day of chasing, I could very well be back in the same area once more, I wasn't complaining. 1000 CAPE once more, strong heating, however this day offered a better convergence zone set up. Flow from the SW and breeze from the NE, they looked to meet over the Sperrins so this combined with orographic lift from the terrain would be the focus point of convection. CAPE and precip models once again favored the W of the country, Tyrone, Fermanagh and Donegal, storms would eventually move SW as the day went on. My plan was to get on them early and chase them SW. I was up early, and by 11.00 I was on the road chasing and shooting another vlog, I was surrounded by clear blue skies and thought how mental it might seem to be out looking for storms in such conditions, those who are not clued into forecasting would never have thought about lightning on such a fine day as this, however all the ingredients were there and when I looked to the W the sky was already talking. Over the hills towards Glenshane/northern Sperrins I could see two or three cumulus congestus towers, crisp white against the blue, they were growing tall and seemed to be leaning over under a capping inversion, I suspected this would break in due course, the temptation was strong to hit Glenshane however I knew the flow would move the area of interest more SW as the day went on and into a region of maximum CAPE, I trusted the models and my instincts and headed SW sticking to my plan. I stopped on a back road adjacent to the Omagh road and watched, I was rite, the towers where now in this area, my targeting was good. I watched from eight miles away as the towers went up then down then up again, I knew the sea breeze was converging rite on that hill top, I was watching the very early stages of a storm being born. I sat on the road, the tarmac was roasting, the surface heating here was phenomenal, the sun cooked my skin fast so I made sure to keep my cap on my head, Buzzards sailed on the thermals far above and all looked good. This would be a solo chase however I knew John Fagan would be on the road after 14.30 so we would likely hook up later, for now it was just me and the elements. I watched for an hour then decided to get back on the main road and venture off into unknown back roads which would take me N onto the high ground of the Sperrins and for the second day in a row I was on countryside I had never been before. The towers were growing tall and I wanted to get closer, I ended up snookering myself on a back narrow road, when I rounded a corner I met two lorries with large mobile homes on back blocking the entire road, they looked to be staying there for some time so I had to turn around and back track the entire way then find a different back road and took it which was a good decision. I was on top of the mountain, I pulled over on the Blackhog road and got out to watch. 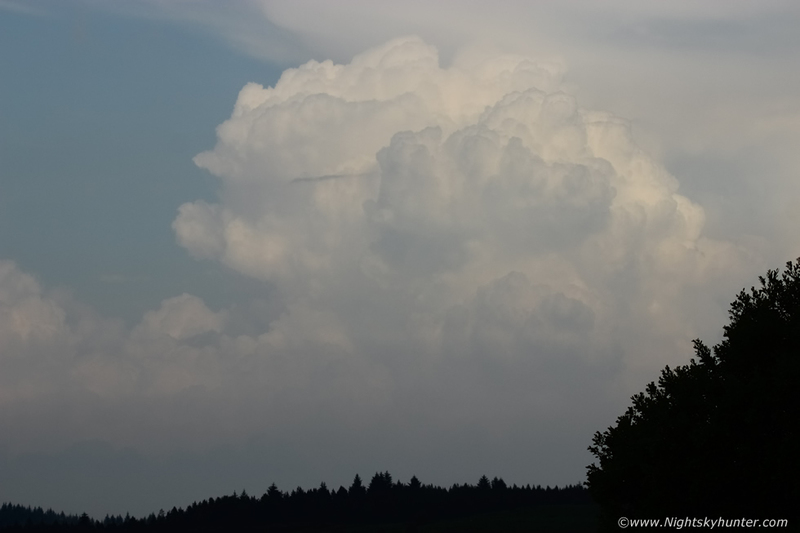 The towers where now forming a cell and producing very light precp, they where approximately 1km in front. It was entirely peaceful here, complete nature, roasting hot and humid. I had a brew and ate snacks while watching the clouds bubble, they were being held back by a cap, however I was patient, I waited and waited, an hour later the first rumble of thunder boomed out across the fields, I now had a storm!, a stronger updraught had punched through the cap and things began to change fast, the cell began periodic rumbling, the whole storm was building over the fields and began moving towards me at a snail's pace. I started time lapsing, at one stage I even had the tripod on the van bonnet so the camera could clear the wild grass. When I turned to my L while at the same spot this new updraught exploded up, it grew higher and higher then broke through the cap too and turned into a thunderstorm, the thunder was even louder from this cell and very frequent with the storm less than 1km from me, I couldn't believe my luck, here I was standing between two close range thunderstorms, talk about choosing a great target area and perfect positioning, it was utter perfection to be honest, to think I had this area visualized the night before and here I was getting the results was amazing. I sat in the grass enjoying the moment, catching rays while the DSLR shot time lapse as thunder rumbled either side of me, I was in my element. I must have been here for a good hour listening to on and off thunder without so much as a drop of rain on me, it's not often one gets to enjoy moments like this. I will admit the storms were not photogenic however I didn't care, I love all storms, to me this was heaven. The first storm still rumbled over the tree line. I noticed that a car had passed me earlier and had once again passed me once more, this time it pulled over 800m down the road and the driver was out watching me, at one stage he had a long lens getting pics of me, unreal how you cant even get peace in the middle of nowhere to enjoy a storm, people have become so paranoid, fearful and territorial in recent times, I have to say I can't blame them, perhaps there have been burglaries in the area or a farmer has had sheep stolen, its understandable. It would be much better if they just came up, stayed friendly and just asked what I was doing and when they seen what I'm at and the website on my van then I'm sure they would feel relief and happy that I'm no threat, I'm just enjoying nature. After a while the car drove off and I was left in peace once more. New updraughts erupted rapidly on the back and side of the first storm, this is the flanking area at 10mm, proper solid towers, I began shooting a new time lapse from the side of the road. Mobile phone shot looking straight overhead, these where high up, thunder booming as I snapped this image, the cell behind me was rumbling away all the time every couple of minutes and the first storm rumbling every 3 or 4 minutes, I was still standing between the two. 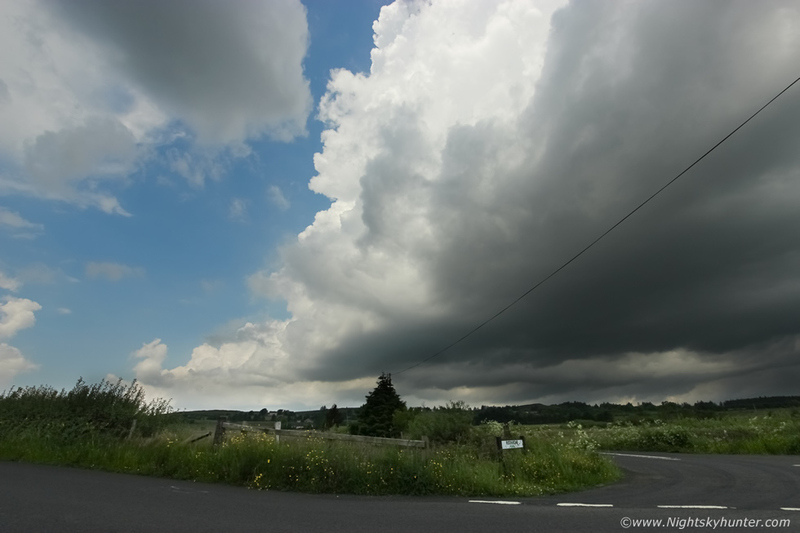 My phone rang, it was John fagan, I explained my situation between the two storms, John said he could see them from Dungannon and could hear the thunder, he was actually in the process of shooting a time lapse of this storm which was a cool thought knowing I was standing under it, John's lapse showed a huge anvil blowing upwind. Two thunderstorms now at very close range, I was getting rain drops on my head from the storm behind me which thundered all the time, I was still time lapsing storm 1 here which now boasted a strong precip core, the storm began pushing rite on top of me with thunder, I never got worried once as all the lightning was in-cloud, however I was starting to get soaked so I got back in the van and drove SW to get ahead of the storm, I ended up half away to Greencastle, however the storm was lacking structure so I decided to get back track to lower ground and wait for new developments. I had a break in An Creggan visitor's centre and ordered myself a nice caramel latte and got online. Outside was heavy rain and loud thunder, I had experienced that much thunder that I was content enough to sip my coffee inside and let it do its thing, it's not often I can say that. 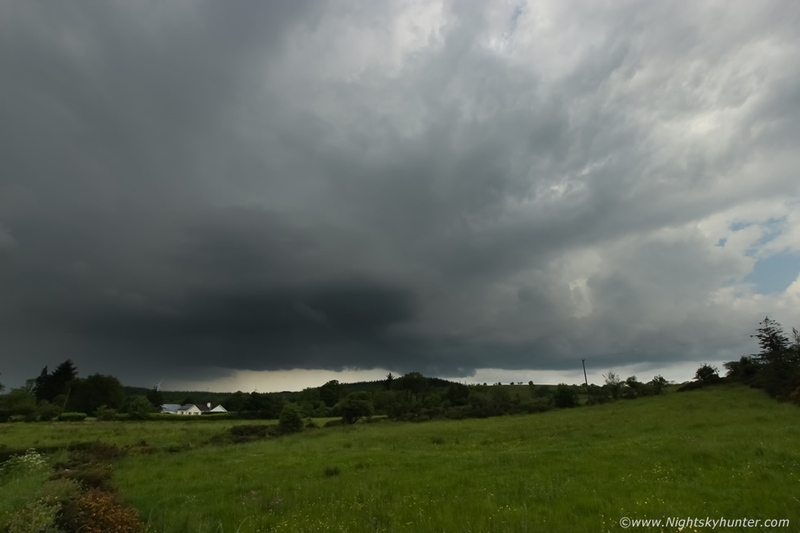 This was the storm that would eventually move into Co. Fermanagh producing prolific lightning and spot flooding for several hours, I had watched it's birth and maturity rite here on the Sperrins up close and personal, I can't have asked for a better than that. At mid afternoon John Fagan and I had met up on the Omagh road, it was still hot with a lot of big towers going up, we needed a new target, we hit the back roads and stopped at Beaghmore for a new plan. Look at this explosive updraught erupting through the heat haze, rock solid, and like an atmospheric nuclear bomb. Radar told us that this was over Ballymoney, we couldn't believe it as it looked much closer, unknown to us at the time it was producing lightning and this very updraught had produced a strong dust devil below it which appeared on social media, the tower was ever so slowly moving SW and heading for Lough Neagh, we decided it would be our new target. It was now rush hour and traffic would be crazy, Cookstown was out of the question so we decided to take the back roads through Davagh Forest and across the narrow mountain roads to Draperstown, this was an adventure in itself and like a rally with dust rising from our spinning wheels, we then cut through Moneymore and made our way to Ballyronan Marina. When we arrived the storm had died, however we shot time lapse of other towers and could hear distant thunder from a big storm over Co. Armagh, the anvil of which was passed rite over Lough Neagh with mammatus on it, the water was calm and quiet, John and I sat on a summer seat and chatted about storms then called it a day, we would have one more chance tomorrow. Our last chance of storms and we decided to hit it hard. Conor McDonald, Paul Martin, John Fagan and I discussed the set up at great length, actually to an obsessive level. A trough combined with +800 CAPE were promising good storms, however the target area looked to be more to the S in S. Antrim, Tyrone, Armagh and Down due to a NE flow pushing unstable air to the SW, Convective Weather had an outlook issued and had their slight risk box in the Armagh/Down/SW Tyrone and border areas, so we where considering chasing there, however early on chase morning we came up with an entirely different plan. The models were showing a striking area of convergence over the mid Ulster area which overlapped good CAPE, the convergence seemed to be near Maghera and Glenshane, then as the Nly flow got going any convection would move S towards Lough Neagh, in fact, high res models showed storms to the NW and W of the Lough and Antrim areas, we decided to ignore the slight risk box and concentrate on the convergence area instead, there was a risk of funnel clouds and brief tornadoes. In Maghera the sun was hot and the air felt humid and thundery yet again, the sky was talking by midday with high based towers forming in proximity to Maghera, Conor McDonald and I decided to do a watch in the local area with the intention of following any developments which might happen, we got supplies at Oakleaf then drove to the top of Glenshane and ended up on the back road where we had experienced a great blizzard back in the Winter time, now the sky was hot and we were in t-shirts sweating, got to love nature. All of us where out, John fagan was on Slieve Gallion and Paul Martin on the Sperrins in Tyrone, it was a good feeling knowing we were all out in force. Conor and I sat on the back road with a brew watching the sky for hours, the sky was hazy and we could see numerous big towers expanding all around us, however they seemed to be hitting a very strong cap and as the afternoon went on we were beginning to have our doubts about it breaking. 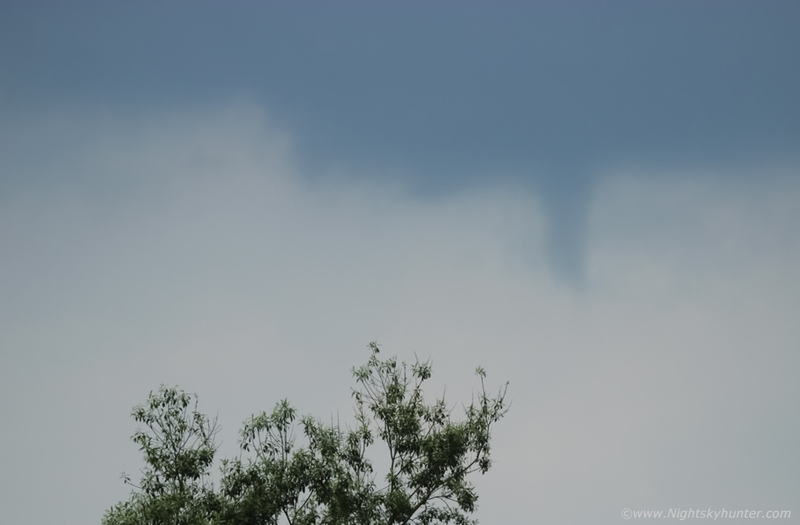 At 16.00 we spotted a funnel cloud at close range to us under the high base of a developing updraught, it was quite smooth and we could see it slowly rotating, the snout seemed to be rotating faster than the base section. 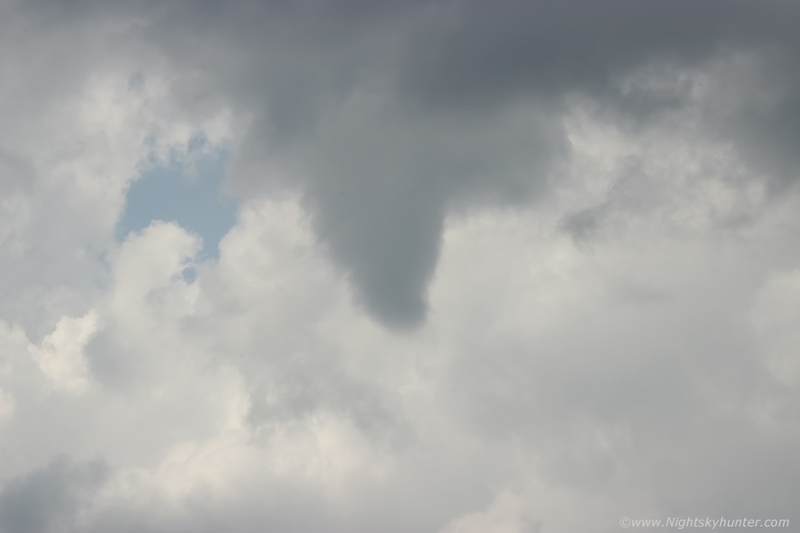 It was dragging tendricals of scud around with it as it rotated. I began shooting a time lapse and managed to get a sequence of it rotating then dying out as it crossed the FOV, that was a nice treat, a sudden funnel cloud which vindicated our convergence forecast. One of those towers began growing into a cell, here's one which which looked like a storm however the tops seemed warm yet the cell wanted to go bang, but the cap seemed to hold so Conor drove home and 15 min's later I made my way back down Glenshane too, then Conor rang, the cap had broke, there was thunder from Maghera, there was a storm beside us, I couldn't believe it, one of those towers we had been watching was now a storm, it had happened that quick. 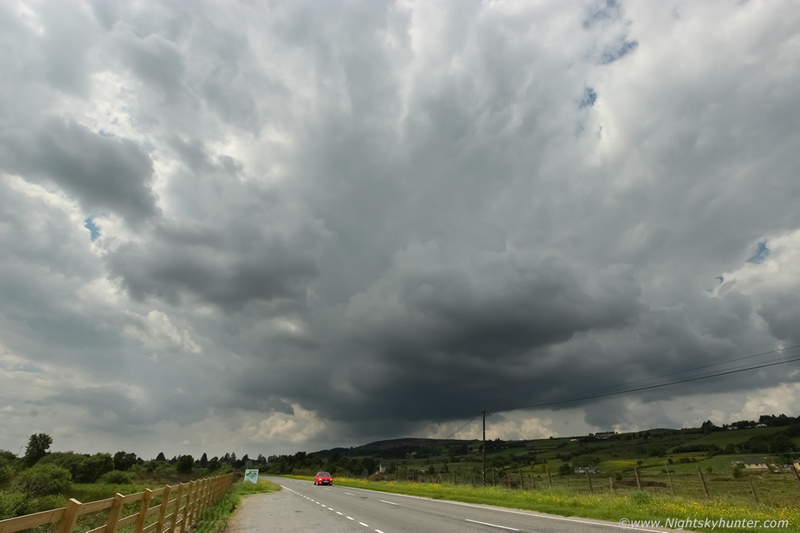 I stopped at the bottom of Glenshane at the junction for Maghera and got out to listen, I could see the cell passing between Maghera and Ballyronan, big precip core and regular rumbles, the atmosphere had done it yet again. 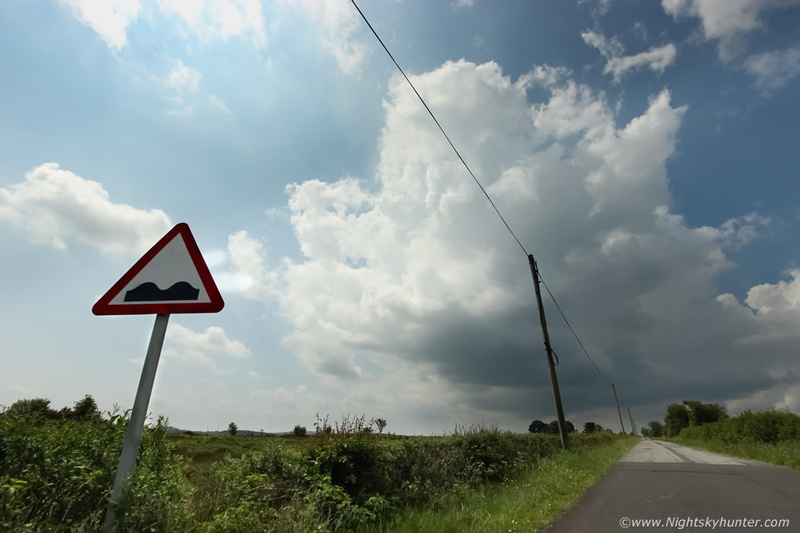 I relocated to the Crewe Road and shot time lapse of the Ballyronan updraught tops which were still rumbling, the road had recently been resurfaced and was full of loose chipping, every time a car passed (going too fast) a few stones would hit my van and several flew past my camera and head, then a new core got me and I was drenched in heavy rain, John Fagan bagged a funnel cloud also from the SW side of the lough so it looked like our personal forecast and target areas were perfect yet again. That evening Roisin and I had a BBQ in the heat and I enjoyed several cold beers, it seemed a fitting way to end a week of good chasing. 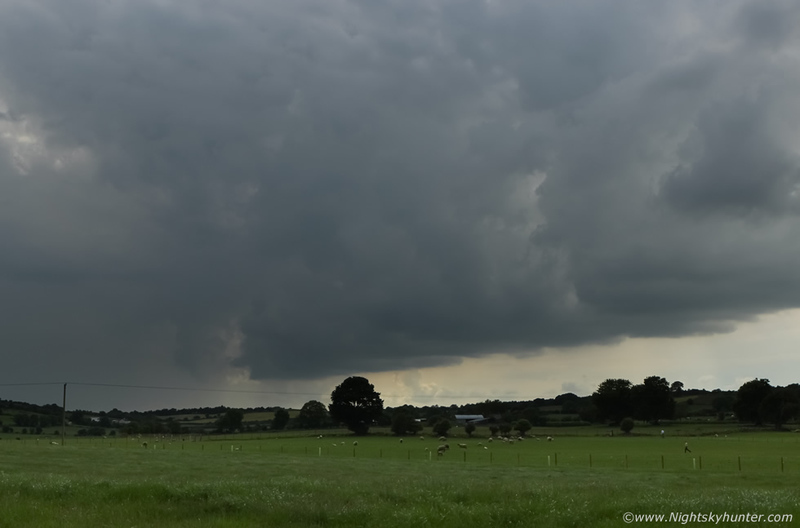 DSLR time lapse of various storm scenes captured on June 7th, 8th and 9th from Co. Tyrone and Glenshane areas, all at 10mm and 50mm, you can also see the funnel cloud weakening in one section. 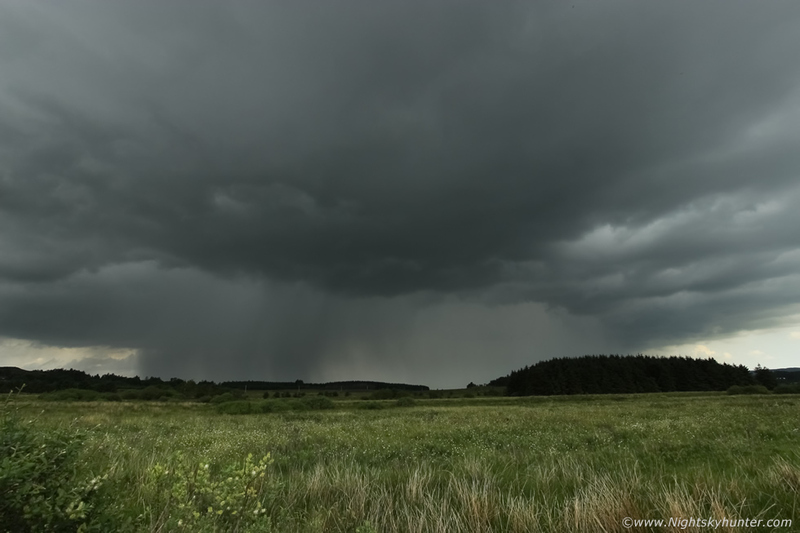 The audio was actually recorded in real time on location of the thunder rumbling and my camera's shutter clicking to add a sense of presence, approximately 3000 images rendered for this. Thanks very much for reading and viewing this very detailed chase report.